Mark Phillipe occasional regales me with the tale of "Electric Tuesday", a day where he got stuck out on the water with a serious electrical storm bearing down on him and the bass biting like crazy. Yesterday Mark Alpert and I had our own crazy day. Electric Wednesday. The striped bass were seemingly willing to bite all day, and the weather, well, electrified anything tall in the boat. It's a day I don't think either of us will soon forget. Patchy fog was forecast for a short period in the morning. We were intending to make a run a few miles to a spot we would use the teasing method for some big bass. We couldn't see the landmarks we needed to see to safely navigate out to the spot though. I'm sure we could have gotten there just fine, but fog is not something to be toyed with. You don't know how long it will last, if it will get worse, or what other worse weather is hiding behind its blank gray mask. So we were reluctant to leave sight of land and never did. That was a good thing, there were periods of time in which the visibility was less than a 300ft. There are days when this would have killed our chances at good fishing. But we got really lucky. We didn't go far at all before we found fish, and they weren't just little schoolie fish. Bass started to blow up just beyond were we started fishing, so we slid over to them quickly to get our shot. The first cast I made, with a white Game Changer, got followed in by a big bass. She shadowed the fly right up to the boat but never took. It was an encounter that lasted an especially long time, at least it felt like it did. I think it's one of the most thrilling things in fly fishing, to have a big striped bass follow the fly right to the boat, nose just glued to its tail the whole way. So, there were big fish here and we wouldn't need to do any teasing. That's preferable, honestly. I'm more confident in getting more than one big bass with two flies in the water rather than just one fly and a hookless plug, but they have to be really worked up for it to pan out and these fish seemed to be. Mark and I doubled up not much later on good fish and got them to the boat, but they weren't what we were looking for. By this time the fish had stopped blitzing where we were, but before we got a chance to move far off the spot A fish started busting next to it. We both cast to it. Mark missed a take, then I got absolutely slammed. I stripped hard, then did a couple quick sets with the rod. "Big fish Mark! Big, big fish!" After initially dogging next to us and giving me a real scare as the line slipped in my hands and I was stuck with a few feet of slack, she charged towards the shoreline with authority. I was afraid she was going to get into the rocks and break off, a very common big bass tactic, so I didn't give her much leeway. Eventually the fish turned out towards open water and I knew it was going to go my way. When Mark lipped her I breathed a sigh of relief. We made a trade: I grabbed the fish, he took the camera. This wasn't "the fish". That one I'm still looking for. By weight she was probably my biggest striper, but at least 2 inches short of my longest bass (38 inches). My goal for the last two years has been 25lbs or better on the fly. This gorgeous fish was probably 10 bunker short. If nobody kills her, the thought of which makes me feel sick to my stomach, she'll grow big enough to surpass my really big fish threshold by next spring. After a short revival this beautiful animal dove back down into the depths, leaving me with a feeling of immense gratitude. I fished a whole season for her. The last time I touched a good striper was mid May. This fish have gotten far fewer and farther between. This fishery really is in trouble folks. Things can't keep going the way they are. We need to speak up, or we'll lose them. And I'm not sure I could live without wild striped bass. The good fishing continued. Mark and I put a bunch more stripers in the boat, and not one of them was under 20 inches. Mark and I both had our issues today. Hookup percentages for both of us weren't great. I'm very happy to report though that I didn't miss even one of the fish that I really wanted to get. There were no losses or misses that will come up in my dreams from this day. 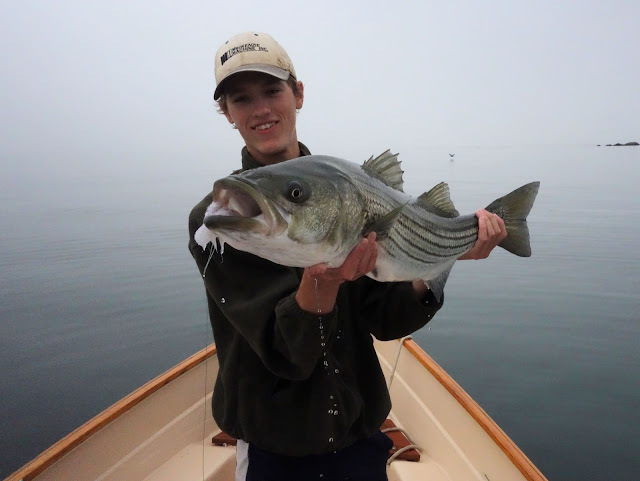 After two years of nearly every time I find big stripers resulting in heart breaking misses and losses (yeah, that's a very sobering thought) this day was a standout. I missed a bunch of fish, but I can't say I'd trade any of them for the ones I caught. Eventually, with the tide coming up, the fish stopped surface feeding. I think the bait had gone, but since it was still dark and foggy the fish didn't all leave the spot as they often would on a sunny or partly sunny day. They were still there, and when we picked the spots apart we could find little pockets of them. It was nearly always in the most treacherous points in the drift: virtually every hookup happened right at the point where we had seconds left before we had to start up and re-position. We kind of left them feeding too. That's not something either of us like to do, but towards the end we heard thunder rumble a couple times. It was still very eerily foggy, we couldn't see the cloud structure to know where the storm was. So we waited it out. Then, as we set up a new drift, I noticed a bizarre high pitched fizzing sound. Initially, I thought nothing of it. But then I noticed when I lifted my rod higher in the air that this fizzing, buzzing noise, like TV or radio static but higher pitched, changed pitch and volume. And in an instant I set the rod down. I new exactly what this was. The only other time it had ever happened, I ducked down and balled up just in time to watch a tree on the end of the dam I was fishing from literally get blown to bits. We were in a dangerous spot here. Lightning was going to strike somewhere, and we didn't want to be the target. We got the boat on the trailer, chatted with a few fisherman at the launch, and got on the road just in time for all hell to break loose. I fish nearly 300 days a year. In that many days there may only be a dozen or so that really stand out, whole outings that I can look back to and remember every bit of, because they were exceptional. This day was one of those days. YES, that was an exceptional day. I'm glad you understand weather situations. It was a great adventure. Thanks for the ride. Exciting, but I wish I hadn't read this one right before I hit the sack! I'm so glad you recognized the eminent lightning, but WOW that was close! Maybe, maybe not. Static like that can exist well outside the zone where CG's are occurring, sometimes miles away.